Larry believed he possessed a rare opportunity through his celebrity status to bring attention and focus to public health issues, charitable causes, and environmental issues that he thought were important. Together he and his wife advocated for health education, arts education, and environmental awareness. Read more about their philanthropic endeavors below. 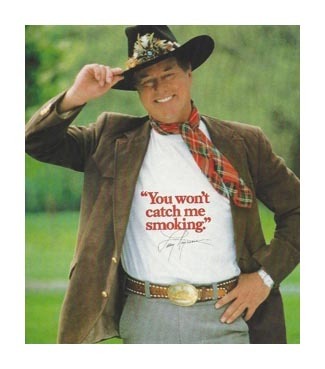 An adamant non-smoker, Larry was chairperson of the American Cancer Society's "Great American Smoke-out", from 1981 to 1992. During the eleven years he served as chairperson the campaign was successful at increasing the awareness of the dangers of nicotine. 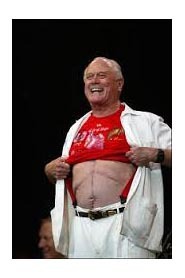 In April 1987, Karl-Lorimar released "Larry Hagman -- Stop Smoking for Life" on VHS. Proceeds from the instructional home on how to stop smoking went to the American Cancer Society. In August 1995, Larry received a life-saving liver transplant during an operation that took 16 hours. In the months following the recovery, he became an ardent advocate of organ donation and later was invited to serve as a spokesman for the National Kidney Foundation. In 1997, he was invited to serve as the National Spokesperson for the U.S. Transplant Games held bi-annually to help raise awareness of organ and tissue donation while fostering health and fitness for transplant recipients. In 2001, Larry was invited to serve on the U.S. Department of Health and Human Services Advisory Committee on Organ Transplantation (ACOT) which was established to assist the HHS Secretary in finding ways to promote organ donation awareness and ensure that the system or organ transplantation is grounded in the best medical science, was equitable and effective as possible, and at the same time increasing public confidence in the integrity and effectiveness of the transplantation system. In his promotional campaign to support ACOT, Larry said, “As one who has personally been touched by the gift of life, I encourage you to work with me to drive home the message that organ donation works and every American should consider it”. Larry served for four years. In February 2011, Larry received the Bob Krueger Public Service Award in honor of his efforts to heighten awareness of the need for organ donations. Contrary to his popular image as ruthless oil baron J.R. Ewing on TV’s Dallas, for more than a decade Larry served on the board of the Solar Electric Light Fund (SELF), a Washington, D.C. based non-profit whose mission is to bring solar energy to developing countries to assist those in energy poverty with their economic, educational, health care and agricultural development. Since 1990, SELF has completed projects in more than 20 countries and pioneered unique applications of solar power in Benin, Haiti, the Amazon rainforest, South Africa and Nigeria, improving the lives of the 1.5 billion people who don’t have access to electricity around the world. Larry served on the Solar Electric Light Fund Board until his death. Larry was a vocal advocate for solar energy and an earth-friendly lifestyle. In 2003, he fitted his 46-acre Ojai estate with, what was at the time, the country's largest residential solar power system. Larry and his wife both drove a Prius and during an interview, Larry proudly stated that at that time, there were five Priuses in the family. In 2007 Larry made an appearance at the National Biodiesel Conference and Expo in San Antonio, Texas and discussed his support for alternative energy and sustainable and renewal energy resources and urged support for alternative energy sources. On a 2008 episode of Living With Ed, Larry and his wife showed actor Ed Begley, Jr. their solar powered, super energy efficient home named "Heaven" and talked about their gren lifestyle. In July of 2010 Larry became the spokesperson for SolarWorld, a company that manufactures and sells solar power worldwide. For SolarWorld, Larry appeared in numerous television advertisements in the U.S. and Europe as the J.R. character. "I have nothing more to do with oil. I am producing my own energy ... solar energy," Larry proclaimed in one of the ten television spots he made for SolarWorld. With the slogan "Shine, Baby, Shine!" 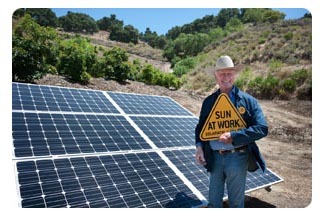 Larry played off the oil industry’s rally call, “Drill, baby, drill,” to promote solar technology. SolarWorld donated solar panels for the Solar Electric Light Fund’s work in Haiti after the 2010 earthquake. Solarworld gave an additional 100 kilowatts of panels to provide electricity for at least five health clinics. 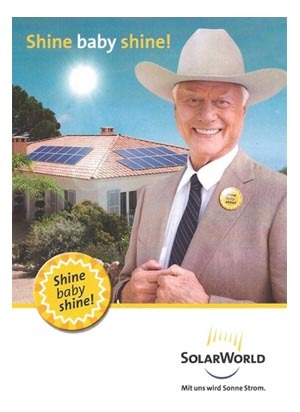 In return, Larry made the commercials for SolarWorld. Larry worked with local philanthropists to develop The Ojai Performing Arts Theater, an ambitious project that hoped to develop a facility in conjunction with the local public schools to provide arts education while providing a theater that could bring bigger plays and concerts to the tiny town of Ojai. Larry lent his voice to making local public service announcements for the Boy Scouts, the Boys and Girls Club, Habitat for Humanity, local drug rehabilitation programs, the Diabetes Association, the Alzheimer’s Association and for the California Drug Court Association who advocated and educated local governmental courts to consider alternatives to incarceration for certain drug offenses. True to his words, Larry's last public appearances was on Nov. 15, 2012 at a charity benefit in support of the White Bridle Society, a non-profit organization that offers therapeutic riding and horsemanship skills to children with developmental disabilities, primarily children on the autism spectrum. He posed with his long-time friend and former co-star Sheree J. Wilson, who is acting president of the non-profit and who had played April Stevens in the 1980s Dallas show. It was just one week prior to his death. 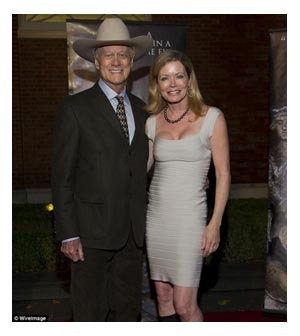 In Larry's honor, on Sept. 21, 2015, on what would have been his 84th birthday, the Larry Hagman Legacy Library officially opened. The library's goal is to preserve Larry's legacy in television history, and to continue in his footsteps by supporting the charities he personally endorsed. For more information, please visit Larry Hagman Legacy Library - we hope with your support we will carry on Larry's wishes to 'give back'. Thank you.